Commercial - What would Dennis Do? Heat recovery variable refrigerant systems. Many just do not get why heat recovery is such a good option. The general opinion is that you can choose heating or cooling from indoor units instead of the heat/cool only choice with heat pump system. No... You save mega bucks for your client especially when you factor the correct diversity of operation , this is the combination of connected units and size for the total kW allowed. Manufacturers allow over connection above 100% capacity because diversity suggests not all units will run at the same time. This is a great idea and very sensible. Now what if the ratio of heating to cooling hit 50/50 from all connected systems to the outdoor. Well you have met the realised saving that heat recovery offers. You see .... The liquid condensed from the units in heating mode will provide the capacity for the units running in cooling mode. And the heat the units pick up in cooling mode become the capacity for the units in heating mode converted by the outdoor compressor. And what do you get? You get units interchanging heat picked up within the building without the need to introduce further heat or reject heat from the outdoor unit. The outdoor becomes the pump only to transfer energy between the indoor units. Such a wonder of sustainable technology. A building swapping its internal heat-loads within itself, the ultimate energy management requiring no additional input/output from/to the outside air. It was not about the customer having the choice of heat/cool from his office unit. That was the bonus , not the reason. You have to admire this and why it has becomes such a popular alternative to conventional building AC management. Take note how the condenser is primarily just a pump and that the actual; energy transference is limited within the inside only. the outcome is massive in terms of energy saving. Installation of Air Conditioners and Noise. Air conditioners come into two categories. Those that have fixed sound emissions by constant speed compressors and those that are tonal such as inverter types , where they produce different octave bandwidths depending on compressor frequency. Unfortunately , the laws for tonal systems are far more stringent and require greater barrier distances. I suggest to read up on the publications , they do give much information. But some other things to consider to help in sound reduction. Manufacturers may provide in built logic for low noise modes at night which can be automatic fuzzy logic and/or manually switched at need. They cut down the number of fan steps (rpm) which is where the majority of noise is created, In winter though, those fan steps are needed for heat pump capacity in low ambient. This may require an optional card or a local program code to be entered. Installation is critical, a bigger machine will produce more noise, and sorry to say , that's just common sense regardless. Installing the right support base for the units weight displacement is critical, so please check the installation manuals for your unit. If not , you may put undue stress on the machines centre of gravity and it will vibrate or resonate more. A stand off from the ground is a good idea with large machines, Apart from keeping things clean underneath , a 150mm height will produce an air break for the sound and prevent base transmission to concrete which also can be an issue for transmission of noise. Using wall brackets for large kW machines may not be a good idea, the only place the sound can go is into the wall mainly but it provides a good air break. Facing condensers (finned side) away from windows so that the customer does not cop more noise. Lets face it, most cheap windows do not attenuate very well. Since the condenser is finned it does not provide a full barrier to noise transmission like the metal front end panels. Better to face brick, it will reflect sound though. Placing a condenser facing a larger open area is better , for example in a house side walkway, facing the walkway and not the fence. Less reflective areas. This depends on house by house arrangements according to other sides it may encounter which you allow for in the sound calculations. Lastly , remove shipping bolts from compressors , many do not and they have no suspension. points of a heavier outdoor air-conditioning unit can have a good effect. This is not just for stability and/or centre of gravity , but can reduce noise. Not a new idea, in fact invented over 100 years ago by designer Leon Crux. His aim was to get it to work with steam driven equipment. Unfortunately they did not have the casting technology to make it a precision fit. Combined with inverter driven speed control this system produced energy savings not previously seen and the ability to be able to compress liquids (flooding) in a limited capacity due to the no valve construction. A couple of things to note with scroll designs, systems with less compression ratio's do not need a check valve at the discharge but those with higher are equipped with a non return valve at the discharge port. Scrolls can be suction gas cooled for medium to low temperature and also discharge gas cooled in air conditioning applications. Because air conditioning has better compression ratio's the discharge port temperature is still low enough to cool the windings down. This increases efficiency. Some compressors use differential gas oil feeding where the high pressure dome models (discharge cooled) will force oil up the crankshaft which is hollow and feed oil through suction ports to the scroll. (pulse width modulation) to control capacity , this not an inverter type but a constant speed unloading system. Manufacturers of AC equipment are now casting their own scroll designs to increase capacity by increasing scroll depth. Its really just adding more volume to an already proven system. ​Return Air on Forced draft ducted fan decks. I have seen a few instances where an inverter system ducted lost control of temperature and capacity due to issues with ducting. Forced draft ducted models typically have a system return air thermistor located to one side of a fan deck. In many home designs it can be the case that the return air duct , which is usually a couple of 400mm flexi ducts on most medium range ducted models becomes impinged or squashed. This converts to one side trying to take more capacity in and a negative pressure zone is created near the fan scroll which is on the side of the impinged ducting. Depending on design and location of the return air sensor , it can find itself void of correct sampling due to an eddy air vortex. Even if the problem is resolved by fitting a remote sensor , the issue of capacity is not and inverter models will likely not achieve full capacity when needed. This is rare fault and depends mainly on system design , temperature issues are quickly spotted by customers. Statical pressures in duct will increase when squashed and restrict airflow as most know with supply air. 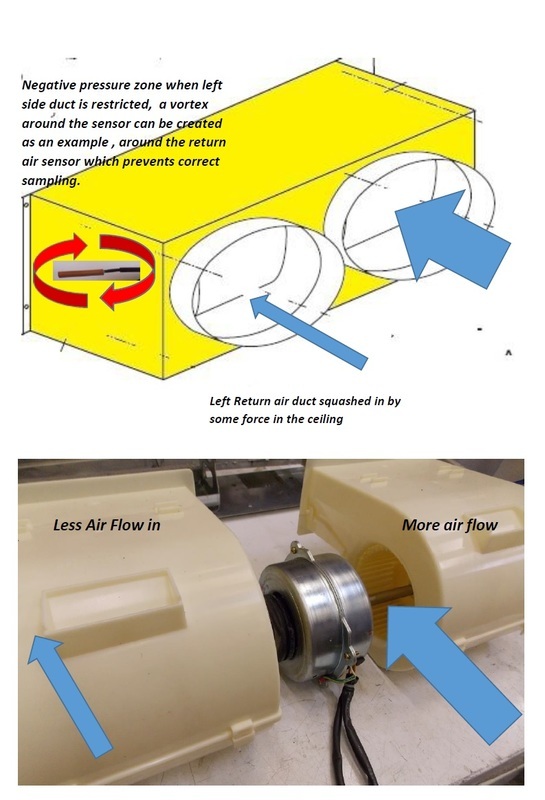 With return air, negative pressure zones and air vortex's in the return air plenum can also be created. Return air ducts should be as short as possible and try to achieve the length specified by manufacturers tables to abate sound. Good support is needed, watch out for running flexi type RA ducts in cavity walls between levels in multi storey buildings. The problem is only with flexible duct and can go unseen for a long time until peak demand is needed. Not a good idea on cooling and far worse on heat pump mode. Refnets or branch flow splitter. VRV (Daikin patent) others VRF use multi system connectivity using true liquid lines. The EEV (electronic expansion valves) are based typically at the indoor units and not expanded at the outdoor like other systems. Now lets not beat around the bush. Pushing liquid around and at elevations requires pumping pressure. Compressors have to overcome a lot of line resistance and statical pressures to move liquid around. Enter the Refnet. A part which splits flow from one line to two , a type of branch division for re-directing flow to another unit and or/location. In particular the design of this pipe branch has been specially done to reduce as much losses to flow and even the distribution of flow across the two points where one becomes two. Yet some think that a t-piece might suffice the same and Im sorry to say that this ends in disaster. Equivalent lengths in multi system design do not play by the same rules as what we consider in a typical refrigeration system with standardised copper fittings at around 50m piping distances. In fact its a precise game of pressure drop and it is factored on internal rules of losses by the manufacturers based on their designs and these can run up to 165m away from the outdoor unit. Refnets work ok in a vertical position as gravity is even at all angles but in a horizontal aspect it must not exceed angular limits otherwise flow will be given to the line below the other at gravity's favour. Many think that refrigeration system running at higher than atmospheric pressures can overcome gravity but , no it cannot and this is really should be remembered during the installation phase. Despite what you might think about refnets and custom made branch splitters , you should always use what is recommended and install to specifications. A t-piece creates large losses in pressure and remember that all pressure losses de-rate overall system capacity. You ever wonder why people quote on split systems in server rooms?? I mean if you have $300,000 plus of equipment in the room and a $2000 split or semi commercial to service it?? This pic below thankfully does not suffer that issue and uses appropriately designed HVAC control. Splits , cassettes , ducted. are not always the best choice for precision control given that what is off the shelf in the market was meant for people not computers. yet they provide a fast and cheap alternative. Humidity is just as important as temperature control since if the humidity hits under 30% you can generate static electrical discharges. Don't believe me? well in supermarkets with excessive cooling capacity , ever wondered why you get zapped pushing the trolley around sometimes? Its not because of your clothing but the lack of discharge ability to very low humidity and the charge is generated by the trolley in motion to the floor. If some use a split for a micro server system, they typically size on total capacity of the AC unit but in fact its better to size on sensible heat capacity only. there is not much latent going on in a computer room other than occasional air changes. A 7kW system for instance is not always 7kW of sensible heat load. Consultants usually are aware of that. A system should be generally oversized based on the sensible heat capacity only to the electrical KW capacity generated by the equipment. Humidity is always a factor , oversize it too much and you end up with static dangers. Even in well controlled rooms they use statical wrist straps earthed to the cabinets to arrest any charge when servicing the pc equipment. These wall splits are without doubt the worst choice and based on the fact they were never meant to control the environmental needs of computers, they can fault under duress. High indoor , high outdoor ambients and running over 27.c continuously they will go into protective modes and downgrade capacity or stop operation. 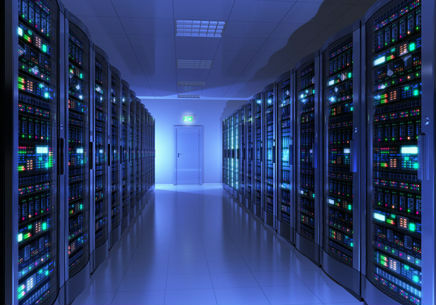 Not only that , the server equipment generates constant heat output where as people are not always constant. Most high end systems use humidity control and more specialised equipment with PLC control. Some manufacturersof air conditioners offer their own network solutions to integrate and control building environmental conditions and utilise their product to the fullest. Now many see this as add on expense or some contracts require other types of Building automation packages. Now that's ok , the majority seem to work well. Im a fan of using theirs myself where possible. They have so many energy saving features built in now that are so under-used or ignored. These manufacturer products have ready engineered closed loop controls so that you just cant mess with their product and so they offer you optional extras such as option cards that allow some external functionality, mode control change. Or local unit input basic I/O digital such as forced shut downs or external on/off. They also have their high end control products too, lets not forget they are also competing in the sales market. If you want your system to your to talk to theirs , most times you have to use a gateway device. And that's also ok if you are using their inputs and status to direct building operations. When you layer the BMS controls (onion style) to try to cheat that, eg another sensor is places next to the supplied on with the equipment, things just never seem to work that well anymore. And that is where you can add your 2c in here if you like. For those who do not know what a Bain Marie is, It is a term for a double boiler. One pot boils , the other sits on top with the food being prepared, like they do when melting chocolate. It is also terminology for food service dispensers used in commercial catering. 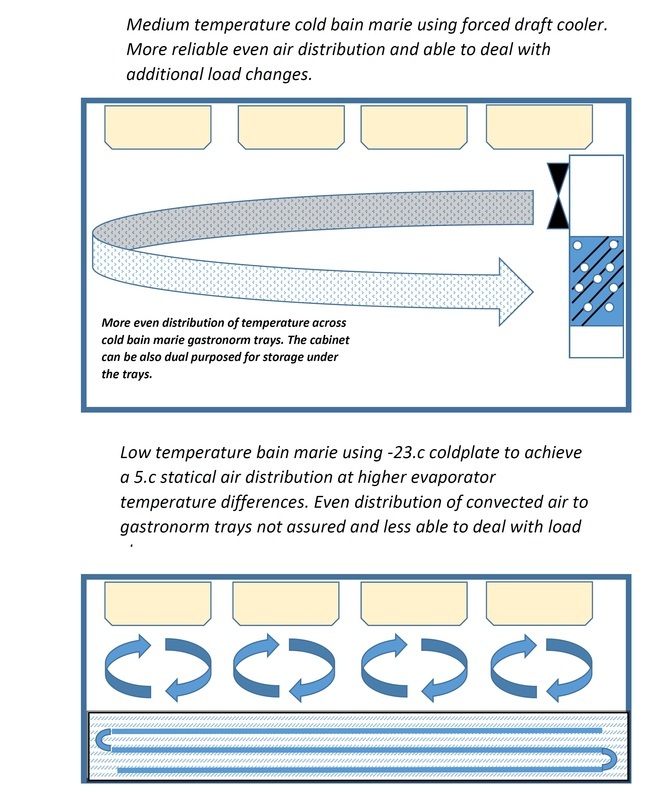 In this case prepared/cooked food is placed in trays which are put above a hot water surface to keep the food hot , or a dry heated surface using elements only and also a cold version which uses a cold surface to maintain the food at low temperature. These trays come in a standard size and also fractions of the standard size know as a Gastronorm tray or dish. 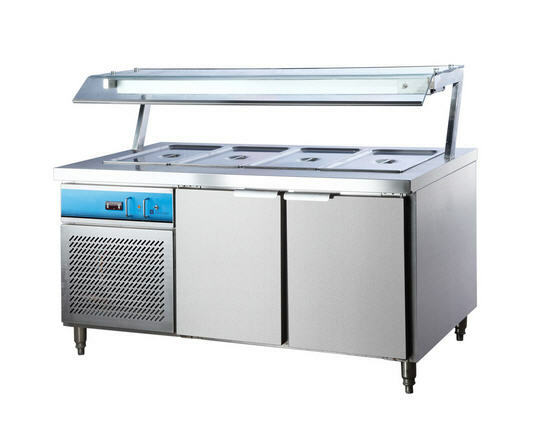 There are two variety's of cold bain marie. In our trade we know them in one version as a coldplate. Coldplates used for direct cooling are better where food in close the surface. When it is used in a shallow well air cavity for statical cooling Not as effective. Of course food should always be placed in these units at design temperatures as they are not good at maintaining load changes. Another problem is the use of stainless steel trays. While a good choice for food , a poor conductor of heat and a bad heat transfer agent. The best choice for cold food bain maries , and mind you this is my opinion here is the use of forced draft cabinets which use typical fan heat exchanger to move air around. In the case of air distribution and ability to deal with some extra load , much better than low temperature versions with shallow wells. Combine this with the cabinet also being dual purposed as a kitchen bench type refrigerator, a very cost effective idea. The industry is an ever constantly changing platform. Excellence comes out of where you do not expect it. We seem to prevail in this trade compared to others and there are many reasons why. Many would like dual tickets, where electrical and refrigeration combine. Yet another evolution comes in the form in engines , where we see natural gas driven combustion engines drive refrigeration equipment. And so a new tech is born. Gone is the inverter variable system, replaced by engine power driving a compressor with rpm controlling capacity. The natural gas motor leaves a lesser carbon footprint and is great for area's where power may be limited or where building design can reduce the need for grid power. So we have to now consider what other skills we may require and one of them is a gas ticket and engine knowledge. Are we going back to realm of being called refrigeration mechanics once more. 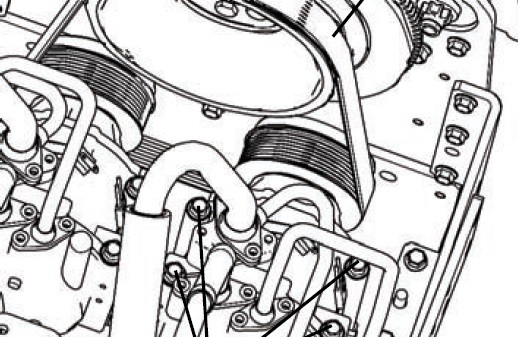 So.....is belt driven equipment a reversal of progress or a fact of energy efficient design?. And..... who thought you would ever see a starter motor on a condensing unit? Daikin and Yanmar are leading the way with this tech. It might seem odd for a 3 piston, water cooled, combustion drive motor to be sitting in an outdoor condensing unit powered by natural gas. So if a engine sounds like its starting up on the roof your working on , then you might be in the presence of a gas powered heat pump. And you thought this trade was all about one thing?